The bedroom is considered a human’s safe haven after along tiring working day, thus it must be comfortable, relaxing and provide the needed tranquility. It can be designed in a contemporary style to give it an everlasting renewal feeling. 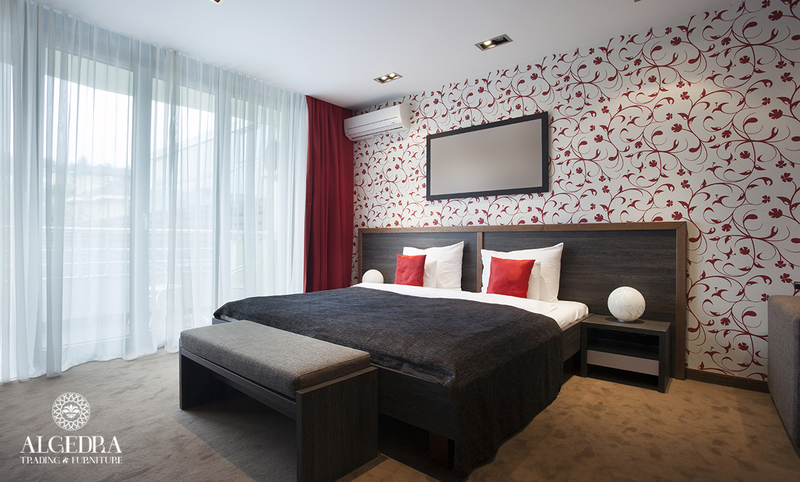 The following are ideas by ALGEDRA to help you design a modern and contemporary bedroom. The modern touch means simplicity, beauty and elegance in addition to maintaining the basic function of the room, which is a place for rest and relaxation, so you must pick everything carefully! And you Can choose one color and mix all its gradients in the room, for example, cyan for the walls, white wood used in bed and cupboards, and the bed curtains covers are a combination of indigo and navy blue and dark and light blue which appears through the inscriptions of the curtains and blankets. 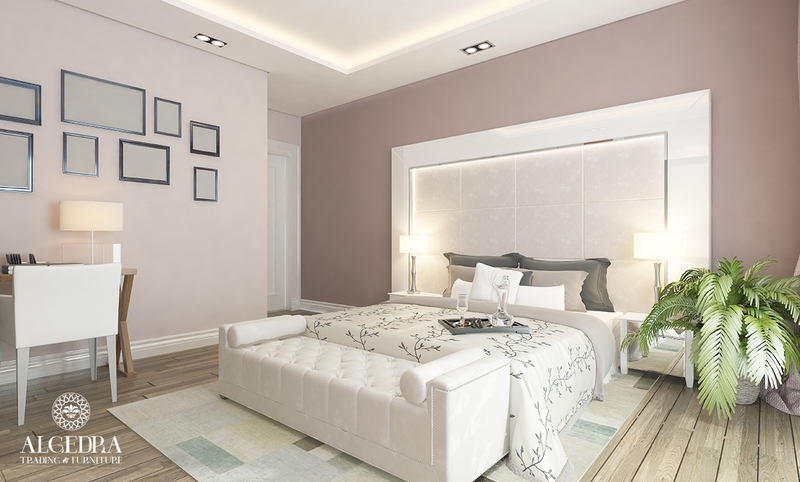 As For the walls you can use your favorite color that suits in with the rest of the room , you can also use patterned contemporary wallpaper, or you can use a white stone walls for the entrance with some wood, which gives a great space and enough light it is also something new and trendy in the world of decoration, You can also decorate the wall behind the bed and color the rest of the walls in one color, all of these are modern ideas to help in the selection of the appropriate format for the walls. The wooden floor is always the dominant, so you can rely on a solid wooden floor and, or you can also use polished patterned tiles which are modern, beautiful and practical at the same time. The modern decor depends on large windows, which can be in the width of a whole wall, they help in good ventilation and lighting for the room, or you can replace a large window to a large number of small windows to serve the same purpose, and to give the room the modern healthy appearance. Modern decor takes care of the meticulous details, and it relies on simplicity, elegance and comfort, Metal is prevalent in the world of modern decor, so you can use a low bed as low as the floor, of linen that suit with the colors of the walls, and put so many colorful pillows, for the cabinets you can use wooden cupboards and their entrance have some metal to give a luxurious and modern look. For curtains you can use thin curtains in light colors, which help the sunlight to enter and give the room a sense of freshness, carpets in this design rely on simplicity and they are free of complex patterns and drawings in modern designs, so you can acquire carpets with one color and have high wool to provide warmth and intimacy, for lighting use simple modern chandeliers that are known for their elegance and simplicity.